The playground is one of the best places to practice large motor skills with children. When you are indoors, space is limited and the children may not be able to exercise their large motor skills to their full capability. Large motor skills include use of the arms and legs to walk, jump, run, exercise, etc. Being able to practice these skills helps children in their development and growth. For infants who may be crawling, setting them in the grass to crawl is a great sensory experience. The child gets to touch, smell, see, and hear all new things in nature. If the child seems hesitant or afraid of the grass, you can place them on soft mats or blankets. Crawling tunnels can be added outside as well. For infants who are transitioning to walking, you can walk them around the playground with assistance. Get creative! Anything that gets the children moving around is beneficial to large motor skills. 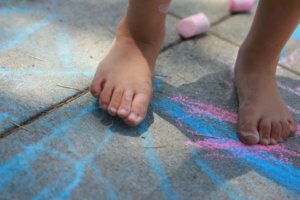 Draw a mixture of circles, squares, and hearts (or any shapes you prefer) with chalk on the ground. Make sure they are big enough for the children to stand in. Draw enough shapes for each child and a couple extra. Tell the children that when you say “GO!” they are to walk/run around until you say “STOP!”. When you say “STOP!”, each child should run and stand inside a shape. Tell the children in each shape to do a particular large motor skill. Feel free to incorporate any skills you think the children will enjoy and will get their bodies moving!